A lot of women color and highlight their hair every month or so to cover up grays or to achieve a new look. But lately there have been concerns about potential health risks associated with frequent hair dying, not to mention how the chemicals can dry out and damage your hair. So finding ways to reduce their use just makes good sense. There's a product from France that can highlight your hair, prolong the life of your hair color and thereby minimize exposure to commercial hair dyes. Reflet Shampoo and Reflet Crème Care can also be used to pump up the highlights and shine of natural, untreated hair. I decided to try Reflet on my own hair, which was already colored dark brown with chestnut highlights, to see if it lives up to its advance billing as an innovative repigmentation shampoo and conditioner. It works somewhat like a semi-permanent color in that it doesn't lift color, rather it adds pigment to the hair surface. 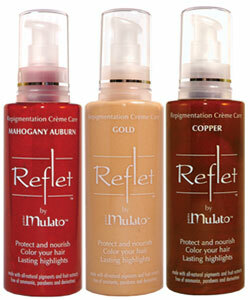 Reflet products come in 6 shades. I used the mahogany auburn shade in both the shampoo and crème. What I liked is the absence of harsh chemical agents. Reflet products are free from toxins, ammonia and parabens; instead they contain mineral pigments, organic fruit extracts (like bitter cherry and blackberry) and shea butter for moisture . First I applied the Reflet shampoo. This is a deep cleansing shampoo only to be used once a week. The fragrance is quite strong but pleasant, like fresh summer fruit. I was glad it wasn't too pungent because the shampoo has to be left on for 5 minutes before rinsing off. The Crème Care is recommended for use every two weeks to revive hair color, cover roots, and conceal grays. I applied it on my damp hair, just one tablespoon or so, massaged it in wearing gloves, and let it sit for 20 minutes before rinsing. This is an all-natural product so the concentration of fruit extract is very high. Anyone with allergies or sensitivities should do a skin test before using. This is one reason why Reflet products aren't sold over the counter and can only be purchased from salon professionals or through their website. Overall, my experience with Reflet was a positive one. It's a lovely product that gave my hair extra shine and enhanced the color. In fact, some strands were slightly more receptive to the product, which gave my hair and highlights a nice depth of shading. 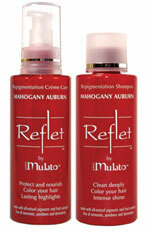 And by extending the life of hair color treatments, Reflet also helps reduce salon visits and at-home color jobs. Even though the cost of Reflet initially seems high ($50 for both 200 ml bottles), you use very little and infrequently so the bottles last a long time - about 4 to 6 months. Who Should Consider Using Reflet? Is worried about the chemicals in hair dye. Has red, copper or brown hair that tends to fade between colorings. Has gray hair and wants it to look healthy and shiny, not yellow or faded. Is pregnant or nursing or has sensitive skin to normal hair dye.